Age: 3-Year-Olds Distance: 1 1 1/8-miles. 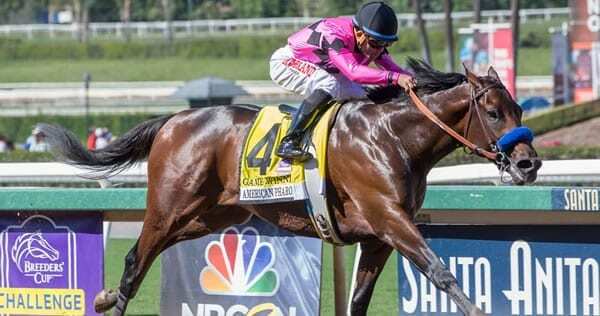 The 2019 Santa Anita Derby has only six horses in it, but two of them are major Kentucky Derby contenders, and it could turn out to be an excellent race. Reigning champion Game Winner is the favorite, and he should be a force as he makes his second start off the layoff. At 4/5 on the morning line, you certainly won’t get much value, but he is the best horse in here. Game Winner comes into the Santa Anita Derby off a nose loss to Omaha Beach in the second division of the Rebel Stakes-G2 on March 16, and he did everything but win that race in his first start since winning the Breeders’ Cup Juvenile in November. He worked six furlongs on April 1 in 1:13.40, and it looks like all systems go for a horse that knows how to win. He should also get a nice trip if everything goes according to plan for trainer Bob Baffert, who also saddles Roadster in the race. Roadster made his first start since September going a mile at Santa Anita on March 1 and defeated fellow Santa Anita Derby entrant Nolo Contesto by 2 1/2-lengths. The latter had no real excuse after a good trip inside, and we can’t see him beating Roadster this time either. Roadster’s class might also be bolstered by the fact that Nolo Contesto defeated subsequent Rebel Stakes winner Omaha Beach in January. The wild card in here is Instagrand. He won his first two lifetime starts last year by 10 and 10 1/4-lengths respectively including the Best Pal Stakes-G2 at Del Mar. Both of those wins were accomplished in wire-to-wire fashion, but he showed that he could also come from off the pace when he finished third beaten 1.5 lengths in the Gotham Stakes-G3 going a mile at Aqueduct on March 9 in his first start last August. Do all of your horse wagering online at Bovada Racebook! The remaining two entrants in the field are More Ice, recently third beaten 9 1/4-lengths in the El Camino Real Derby over the Golden Gate synthetic on February 16, and Synthesis, who was fourth beaten 10 ¾-lengths in the San Vicente-G2 at Santa Anita on February 10. These two seem overmatched in here, but the pace scenario is murky, and if a duel develops, they could rally for a share late. The question is which horse will go to the lead. Instagrand comes out of a Gotham where they went the first half-mile in 44.40 and is already a proven front runner, but Roadster breaks from post one. If Roadster sends early, he could compromise the chances of Instagrand and set the race up for Game Winner.